I don’t come from one of those families that has a million and one relatives and cousins. I remember when I was growing up there was a girl I was pretty good friends with who had her cousins over all the time, always different cousins, always visiting from one country or another, always getting in the way of us hanging out. Mostly I remember being jealous that she had other people her age to hang out with, to be close with, to be sisterly with. Then my baby cousins Lorraine & Justine were born. This was particularly exciting for me, as since I only have the one older brother the concept of having two baby sisters was amazing: I could teach them the ways of the world; I could dress them up and teach them about make-up; it would be like having two living dolls. The only flaw in this plan was the fact that they lived halfway across the world in LA, and I was in London. However, the seed of an idea was planted, and the first time they visited us in London I distinctly remember dressing both girls up in flouncy party dresses and plastering play make-up all over their faces, then parading them in front of my (slightly amused) aunt and uncle, and my (completely horrified) parents. Said baby cousins are now 20 and 19 (although in my mind they will be forever 6 and 5, asking Brother and I to tuck them into bed and kiss them goodnight), both at college (sob), and the eldest studying for the semester in Paris. She popped over for the weekend to see us in London, and I knew that finally I would be able to take her out to a bar or two and continue my older cousin/big sister duties. There was one place and one place only that I had to take her to: B@1, Spitalfields Market. 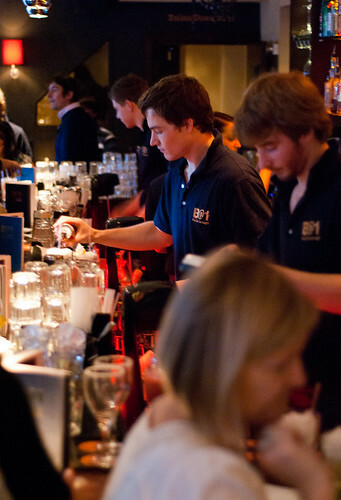 I discovered this particular branch of B@1s in the Summer when my boy Andres was working in London for a few months. 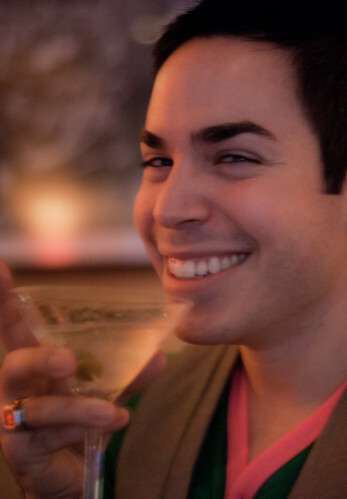 It was literally right around the corner from where he was living and the reason he loved it was the drinks were well-made, the bar staff were friendly (particular mention to Alex, who was our Summer bartender), and the music and atmosphere was awesome. And did I mention the Happy Hour 2-4-1 special? Which is on ALL AFTERNOON/EVENING on Sundays as well as from 5-7pm EVERY DAY? Yeah. The first time I went there with Andres it was a Sunday night and although I drank 6 cocktails I thought I’d only had 3: my maths is not so great. 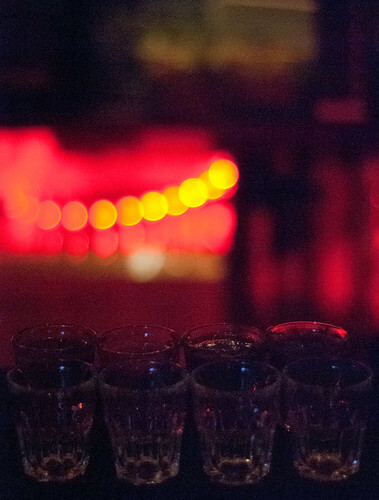 To say I was inebriated is to put it mildly – I probably shouldn’t say this as my family read this blog, but I was absolutely bladdered. And yet somehow the inevitable horrendous next day hangover didn’t stop me from going back, not once, not twice, but three times, the most recent of which is when I took Baby Cousin the Elder to said bar to continue her “education”. The end result, however, was me being that embarrassing older cousin/sister (or possibly aunt) who drinks too much and then makes a huge spectacle of herself. But maybe that’s part of the reason why I really like B@1: you can make a spectacle of yourself, in fact, it’s welcomed. That evening I made friends with my Polish bartender Maciej (pronounced “Match-ek”), gave him a little yellow duckie (I’ve been knitting duckies for charity, but unfortunately I seem to keep giving them away…), and my other bartender, Ollie, made me a banana dolphin with a cherry ball, leaping out of a glass of water (I ate both, and Lindsay, Baby Cousin’s friend, drank the water); a Lemon Man; a heart made of ice and covered in grenadine; and Baby Cousin a paper rose doused in some kind of alcohol which was supposed to make it smell nice (it didn’t. It smelt like alcohol & toilet paper). Could you love them any more? They’re fun and they make you random things when they’re bored. The selection of cocktails available is massive, and all are around £7 or so. 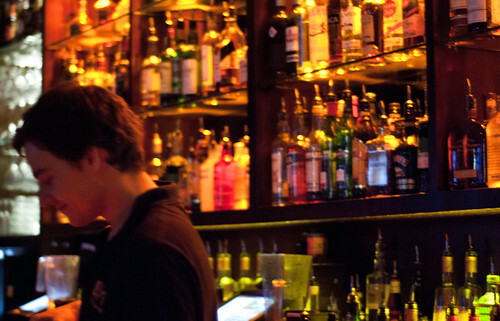 It seems steep, but remember that Happy Hour = 2-4-1 drinks, and then it seems a lot less expensive. The danger in having such a large cocktail selection, however, is that they are often made poorly. Not so in this case – each cocktail (and I’ve tried a few) is made very well, very quickly, and usually served with a cheeky smile from one of the boys. Throw in a little flair bartending, the occasional ice being thrown in the air and much singing along to the music, and you’ve pretty much got B@1. I guess the final word is really that I’ve been back here three times, and I’ve always had a good time. So for me that’s testament enough – I recommend it. And, by the way, Baby Cousin had a good time, too. Even if she had to accompany me home as I stumbled down the street, talking about yellow knitted duckies and clutching my Lemon Man… If good drinks, cute & friendly staff, and a good time is what you’re after, then head on down to B@1, Spitalfields – I promise you won’t regret it. 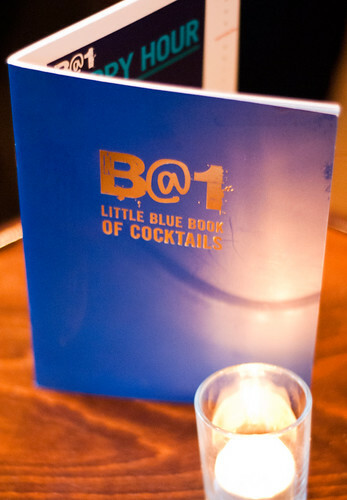 Have you tried out any of the other B@1s? How did they stand up? Let me know! Until next time then friends, peace and love. I come from a small family too. When I married Ryan…I was introduced to a whole new world. He has more cousins than he can count! I’m glad that you were able to spend time with your family and enjoy such a great establishment. I only wish it was a bit closer to me :-) Thank you for sharing. I hope your week brims with hope and joy. Great post! Your writing is so amusing. I very much enjoy reading your posts. Brava! Monet – one day you’ll have to visit me in London, then I can show you the true beauty of B@1! Cupcake – thank you! Glad you were able to find me!